After testing the new It Cosmetics Anti-Aging Full Coverage Physical SPF 50 CC Cream for the past month I thought it was about time to review and swatch it for everyone. This is quite an exciting product as it has the coverage of a BB Cream but the skincare benefits of a CC Cream plus it’s available in a wider range of shades from light to dark. Interestingly enough it’s actually made in Korean and contains snail secretion as one of the top ingredients so you know its going to be moisturizing for those of us with drier skin! It Cosmetics was kind enough to provide me with all five shades of their CC Cream to swatch. I really wanted to be able to swatch all the shades so this was REALLY helpful for my review. This comes in a squeeze tube with an attached pump. I think it deserves to be mentioned I do dislike this style packaging as I find I have to sit around and depress the pump several times to get product flowing especially as you near the end as that less tiny bit is incredibly difficult to get out of the tube. This seems to flow decently well though thankfully! This is a full coverage color correcting CC Cream that contains an anti-aging serum and a broad spectrum UVA/UVB SPF 50+ according to the brand. I would not recommend it for oily skin. I think it is best suited for those with drier or aging skin as it is extra moisturizing. However, it does dry down to a smooth, satiny finish so if you’re careful during application you should be able to wear it on a more oily skin type if you set it correctly. It has a subtle citrus scent that I commonly associate with many snail creams and moisturizers offered in Korea, for your reference the fragrance is very similiar to Tony Moly’s Snail Moisturizer. As with all It Cosmetics products it is richly pigmented so this is a true BB Cream formula versus the lighter texture of a CC Cream. If you have redness, acne scarring, blemishes, dark spots, etc…this will conceal those issues and create a perfect, flawless canvas for your makeup. 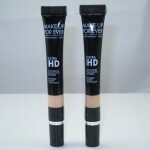 It offers excellent coverage that can be sheered out or worn as a full coverage base product. The rich, creamy texture applies and blends easily into skin however, I would recommend prepping well with moisturizer and primer for the best results as the denser formula can drag a little bit on drier skin. The formula is quite emollient but it still needs that little extra helping hand to look its smoothest so proper prepping and priming is essential to application and finish. The dry down is dewy at first but it sets to a satiny finish within a few minutes of application. It provides moisture on application but also allows skin to retain that moisture thanks to the hyaluronic acid in the formula. There are a host of incredible ingredients in here including peptides, niacin, vitamins A, C, B, and E, and tons of other brilliant stuff for your skin so indeed it takes the CC Cream level up several notches with a formula that offers the coverage of a BB Cream and the anti-aging one of a CC Cream/skincare product. Light was a perfect selection for my skin tone and matched perfectly. It eased my dullness and gave my skin a more radiant, rested look plus it perfected and gave me a brighter appearance with a wear time that lasts well over eight hours without fading or oxidizing. Overall, It Cosmetics CC Cream has an incredible formula with all the benefits of both a BB and CC Cream combined into one product. I don’t think it’ll be for everyone because it is extra rich and creamy and some folks might find this doesn’t translate well for their skin type. I do believe drier, duller skin will adore it as well as those who really need full coverage in their base products. It’s the type of product that perfects skin all around with excellent coverage! I have heard that it states to reapply every 3 hours or so. That would be a dealbreaker for me. I want coverage that stays put all day at work. Plus it makes no sense if you apply blush and bronzer, too. Do you see that on the material? I typically apply sunscreen prior to any makeup (bb cream, etc…) anyway. it does say reapply every two hours…I’d apply sunscreen under it and of course, if you’re on the beach or staying outside all day I would go for a more natural makeup look so you can reapply your sunscreen (not necessarily this cc cream) without screwing with your makeup. Typically if I know I’ll be outside all day I pack my sunscreen and a cheek stain and keep things simple so I can reapply easily. I know this post is a year old but someone reading this might be helped from my reply. The reason why the back of the box says to reapply every so often is because, by law, the ingredients used as the sunscreen are considered a drug by the FDA. And in order for this product to be sold in the United States, it must have drug facts labeling. Now because this product is marketed as a sunscreen, among other things, and the FDA recommends that sunscreen is applied every two hours to be effective, they are required by law to stay that on the directions. It’s unfortunate because it’s confusing to consumers such as yourself, who think that the product is going to disappear or fade after a few hours. This isn’t true. It’s just an FDA requirement. In 2011 the FDA made some changes to the way sunscreens can be marketed. Words such as waterproof, sweatproof, and sunblock can no longer be used. Also any SPF over 50 is no longer allowed to state what their protection factor actually is because the FDA has declared that SPF 50 is no better than 30. I don’t agree with this. But it also points to why this product says it’s SPF 50+. They’re not allowed to say what it actually is, another unfortunate result of the “consumer protection” of the FDA. This product will last all day if you properly prime and set. And if you want it to last longer, it easily does with setting spray. It has great, long-lasting coverage. Now if we could only get the FDA to care as much about labeling for GMO as we could SPF…right! Don’t worry about reapplying it unless you are wiping it off or sweating or swimming. SPF products have to say that. FDA requires tgat they say tgat and have an expiration date if the product claims to have sun protection. This stuff lasts all day. I live in a high altitude desert and I never have to reapply this. I am so happy you were able to swatch all the shades. I like IT Cosmetics though the lack of swatches is my biggest issue with them. Summer’s about to hit so I will pick this up to go with the Julia’s lip tints (Again, lack of swatches on the interwebs) I ordered yesterday. crotchfairy, looking forward to hearing what you think of the Julia’s lip tints, I’m loving these things ;-D been using them daily! Hi Muse. I’ve been considering ordering this but have a question for you: I already have the Bye Bye Redness and love it. Do you think it’s necessary to have both? I’m kinda getting the sense that the two products may be very similar. I know you’ve reviewed the Bye Bye Redness so just wondering what your thoughts are about the difference between the two. Thanks! they are difference texture wise deb and this is more beneficial in terms of ingredients, also this is creamy, more moisturizing. bye bye redness is a more matte, silkier finish less creamy. same coverage options though. Hope this helps!? Should I try this or just keep trying different/cheaper Korean BB creams in hopes of finding THE ONE? I love the chase haha. I am such a masochist sometimes. I didn’t preorder a bunch of dolls that I wanted to get because I love the thrill of the chase, and having them all be sure things isn’t as fun! So I only preordered the ones I figured would be very hard to find lol. So I’m about 3/4 way through my tm du jour. I think when it’s empty I’ll try this one. I wish it was sold in stores. It’s such a nice “core” brand meaning not much for seasonal and a little more reasonable then Chanel. I was leaning towards aqua vitalumiere but I think I might go for this one instead. Thank you for the thorough review! I adore this product. I bought one tube from QVC and after trying it once went back and signed myself up for the auto delivery option. I have a lot of redness/blotchiness in my face, and this covers it beautifully, and my skin is dry so I appreciate the moisture it provides. It’s really buildable so I only use a little on my forehead where I need less coverage, and I can apply a few layers to the reddest areas for maximum coverage without it looking unnatural or cakey. I tried this one and I sent it right back. The smell was overpowering and the shade I got “rich” was not a right match. Even if it was the smell was too much for me. I felt like I had smoothed perfume all over my face. I am considering either light or medium from your photos. If I’m a MAC NC 20-25/Urban Decay Naked 3.0/The Face Shop N21 and lean heavily to the yellow/Asian side, which would be a better color choice? It seems light and medium are very similar in depth (lightness/darkness) but medium seems more yellow…is that right? Thanks in advance! I am interested in this, but it concerned me when you said it’s not for everyone. Is it oily? I wish you posted a photo of yourself with it on! aw sorry kara! 🙁 that stinks sigh! Uh oh…I’m Fairly Light in BE too, and currently wearing Tarte Ivory, although I’m realizing that may be a smidge too light. Now I’m reconsidering buying this. How yellow was it. Yellow like Tarta Amazonian clay Light? That was awful on me. Oops, I meant Fairly Medium in Be Ready in case anyone is using this info as reference. Been waiting for your review on this on before I pulled the trigger. Thanks so much for the shade swatches as so many have stated, this was the main reason I didn’t buy right away. Thank you, I must of missed it. Ugh, thank you so much for posting about this product and revealing that it contains snail secretion! I was just about to purchase this particular CC cream because I love IT cosmetics but I have a real phobia about snails and slugs, and the idea of putting snail ANYTHING on my face gives me the creeps! Think I’ll pass this one up…! What bothers me more than the snail secretion is the eucalyptus oil. I am not sure if that is good or your skin. There are so many good ingredients in this product why possibly ruin it by adding eucalyptus oil? I purchased this in the rich shad as K am African American and this is the only shade for darker skin (which I hate that more is not offered). What I wanted to know is can you offer in site to the undertone of the Rich shade? I am NC 45 in MAC and tend to be a neutral undertone. Also what is physical SPF? Dearest Muse, I’ve been wondering…. are all the lovely ingredients of the bb cream even making it to our skin throuthroughprimer? I use age rewind and missha perfect cover, however this one has my interest peaked!!! What are your thoughts? We must be Pretty (Please) for many years to come and I want all that stuff doing construction on my skin! 🙂 Thanks!!!! Boo Hiss! Where’s Dr Denese when ya need her, right? One of us needs to maneuver a personal relationship with her….STAT! I was looking at this one and wasn’t sure about which color to pick. Like Kara I am using BE Ready in Fairly Right. Seems Light wouldn’t work on me either as I have pink undertones as well. Would the medium work as it seems not too much of a difference on your swatch? Unfortunately, the citrus oils in here can be very irritating to skin. Too bad because the Fair looks pale enough for the fair skinned and that’s hard to find. I was just at Ulta and they have this in stock now! It’s really NICE but even though I have aging skin, my skin is also super oily and this was a little greasier that I wanted but if I lived up north where the weather was drier it would be perfect! I’m still thinking about getting it anyway and just using extra powder but don’t want it to be cakey. I decided to go with the Smashbox Camera Ready CC Cream this time instead…just a little lighter but still more coverage than anything else I’ve tried yet and it’s SPF30. This isn’t full coverage IMO. I have lots of dark hyperpigmentation on my cheeks and this only gives me about medium coverage. The darkness still shows on my cheeks. Even if I try and build it up, it still stays as medium coverage. Will the Bye Bye Redness Cream give me better coverage or is the coverage the same as this? Hi Muse! I’m an NC45 with pretty good condition normal/oily skin. I really want to try this CC cream but I can’t choose between Rich or Tan. Which do you think would be best? Also, do you think this CC cream would be suitable for summer or no? I’m currently on the hunt for a new CC/BB cream or foundation with light coverage that’s suitable for summer. Can you recommend me anything from drugstore to high end that might fit the bill? Wish I could get this in the UK. I love this product except it oxidizes on me after an hour. Has anyone had this experience? Is it only me? How about you Muse? What bothers me more than the snail secretion is the eucalyptus oil. I am not sure if that is good to have on your skin. I am afraid the eucalyptus oil counter- acts all the positive benefits of the good ingredients that are in there. I’m usually Mac NC 20-25 and I’ve got yellow undertones… should I buy it in the color “Light” ? I like the coverage of product however smell reminds me of Lemon Pledge… also my skin has broken out in acne since started using over a month ago. Time to try something else.